Municipality of Maroussi makes one more step towards innovation, regarding city urban planning data, entering into a new digital era. 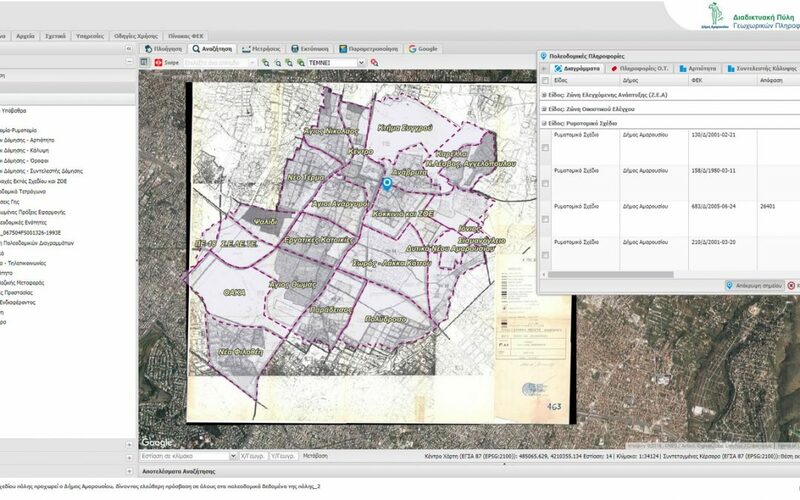 Exploiting technology, up=to-date interoperability tools as well as technical knowledge of human resources, city plan is digitized, providing free access to every interested part, so that via his/her pc, everywhere he/she is, can receive information for a large quantity of data concerning urban planning organization and planning of the Municipality, per urban planning unit, regarding building blocks, building conditions, land use, public spaces, roads etc. “Municipality of Maroussi innovates, pioneers and exploits technology and modern interoperability tools, creating “Smart Maroussi. We continue to achieve our goals for digital governance of the city, with transparency, safety, effectiveness”. In the most economical way, the maximum result, with the use of open source and free access to the application. The acquired knowledge of human resources in municipal services of Maroussi transferred into a digital tool which permits every interested engineer as well as citizen, in order to receive information without visiting Municipality’s premises. In this way, time and money are saved, since human resources’ time is free in order to be occupied in other issues, as well as interested parts do not have to move. The most important part is that there is added value from the use of data, directly and effectively by Municipality’s services, such as environment, cleaning and other services. Moreover, Informatics, as an important extroversion tool, gives tangible and measurable results. Statistically, it is estimated that after the first and half year of operation of the application, the number of interested engineers and citizens who visit municipal premises, will have been decreased by 30-40%, related to current number. In addition, in this way, information validity is ensured, since it will be common and direct for everyone. Municipality of Maroussi in the most economical way ensured the best result, providing free access to all and choosing tools with open source licenses which lead to huge cost saving regarding acquiring and developing the application, achieving also sharing knowledge and information. A dissemination and communication event will be organized in order to present the application of urban planning data digitization. In the next weeks the application will be uploaded at the web site of the Municipality of Maroussi.